Singer: Randall Scarlata (Baritone), Piano: Jeremy Denk. Recording of a performance at the Isabella Stewart Gardner Museum, Boston. ﻿Variiertes Strophenlied in g-Moll mit fünf Textstrophen. Die Segmentierung entspricht im Wesentlichen der Stropheneinteilung, wobei immer zwei Strophen auf ein musikalisches Segment fallen. Die fünfte Strophe wird wiederholt. A und A' unterscheiden sich harmonisch geringfügig voneinander. Außerdem hat A' einen anderen Schluss, der in unserer Segmentierung mit J bezeichnet wird. This feature corresponds to harmonic and melodic properties of a musical piece. Chroma features like CENS are computed by a window-wise subband decomposition of the audio file into semitones (pitches). For each pitch of an octave (C, C♯, D, ..., B), the corresponding pitch energies are summarized up, which reduces the influence of overtones. Subsequently, the resulting chroma features are quantized, smoothed (in temporal direction), and normalized with respect to the ℓ2-norm. For transposition-invariant similarity, we compute a similarity matrix of the CENS feature sequence with a shifted version of it instead of the usual self-similarity matrix of the feature sequence with itself. Thus, we get 12 similarity matrices (one for each shift) and take the point-wise maximum afterwards. 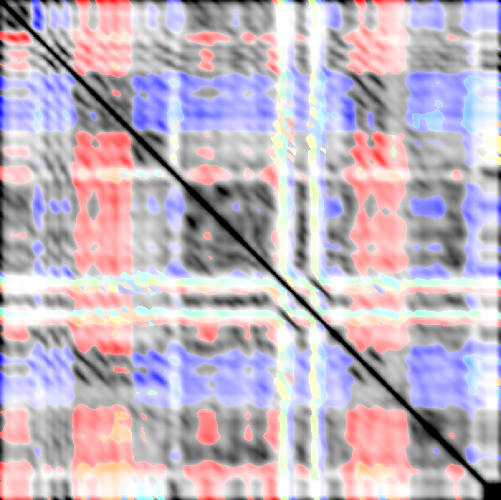 The brightness of the resulting matrix indicates this maximal similarity along all shifts, and the color indicates the index of the used shift. In the following figure the colormap of these shifts is shown. Index (semitones) shift colormap for CENS features. Left: Linear shift scale from 0 to 11, Right: »Circle of fifths« notation. 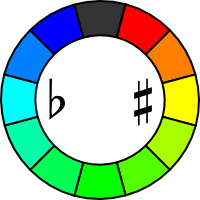 One can see that our colormap is inspired by the circle of fifths where neighbor keys share similar colors. Black indicates no shift, red a shift towards the dominant key, blue towards the subdominant. The green colors are used for more distant keys. Note, that cyan and yellow correspond to the parallel major/minor key as well. Emilia Gómez: Tonal Description of Music Audio Signals, PhD thesis, UPF Barcelona, 2006. Anssi Klapuri: Multipitch Analysis of Polyphonic Music and Speech Signals using an Auditory Model, IEEE TASLP 2008, pp. 255–266. Meinard Müller: Information Retrieval for Music and Motion, Springer 2007, Section 3.3. Meinard Müller, Michael Clausen: Transposition-Invariant Self-Similarity Matrices, ISMIR 2007, pp. 47–50. Gregory H Wakefield: Mathematical representation of joint time-chroma distributions, ISOP 1999, pp. 637–645.